You may have slogged all your life and gathered lots of wealth. But have you ever thought what would happen to your assets after your demise? Advocate Shankar Pai, has a solution to this dilemma. “It all happened in the year 2001 when the Ambani brothers, Mukesh and Anil were having a dispute over the legacy left by their father Dhirubhai Ambani,” says Pai. “The thought struck me – had the senior Ambani made a will, his sons would land up in such a fix over the distribution of their fathers assets,” he adds. This gave birth to the organisation Make A Will Foundation.Pai decided to take up the challenge of spreading awareness about making a will. Through his lectures, he advocates the Three ‘P’ Philosophy – Peace, Prosperity and Progress. “A person lives forever through a will, there is no death. A will is a plan that defeats death. It is a valuable piece of paper that we prepare in our lifetime so that our wishes are fulfilled after we are no more,” says Pai. “A will is something you can reward the person who has taken care of you,” he adds.Pai, now aged 56, was a branch manager at Dena Bank when he opted for voluntary retirement in 2001. 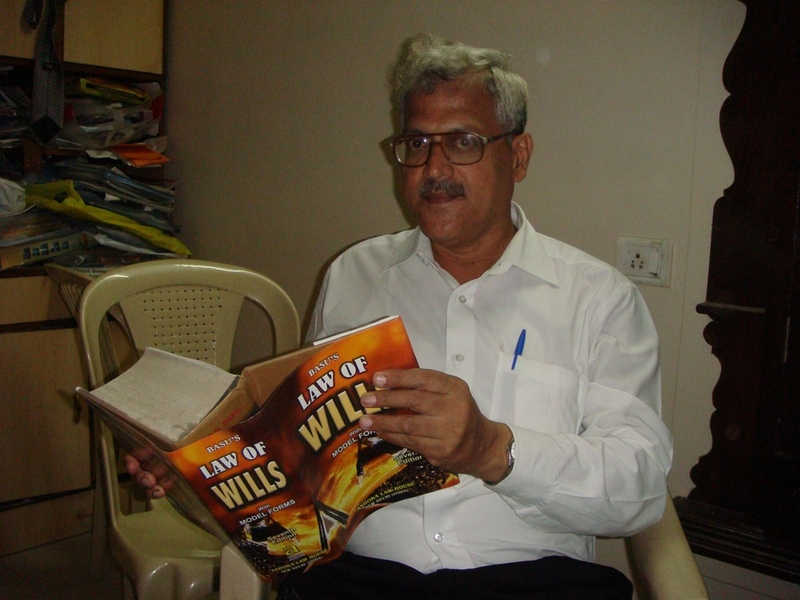 Pai, a qualified lawyer also practices at the Debt Recovery Tribunal in addition to making wills. Pai encounters numerous problems while spreading awareness about making wills. “A will is a sensitive topic to open up to. In India, people are not comfortable discussing a will. There is a misconception that if someone tells you to make a will, the person thinks that indirectly you are telling him that his end is near or that you are eying his property. However, all apprehensions disappear when I tell them the consequences of not making a will,” informs Pai. Pai tells people that making a will only eases the burden on the heirs to distribute the assets of the owner. The owners responsibility is to make a will devoid of disparities while the law will intervene only to clear the disparities. At Pai’s lectures, he clarifies that making a will is not a complex process. All it requires is a plain sheet of paper (not a stamp paper), details of the willed property and the signature of the testator (person making the will). In addition, the signatures of two witnesses are required. It is not necessary that a will has to be registered but, one should try and register it in case it is likely to be challenged in court after the demise of the testator. In case the two witnesses are a doctor and lawyer, then the will is likely to face less legal obstacles. Although not necessary, the doctor’s attestation is beneficial to prove that the testator was in good health while making the will. Pai also clarifies the finer aspects of wills. Contrary to popular beliefs, a will is not irrevocable. It can be revised as many times as the testator wishes to. However, each time the will is revised, a new signature and declaration stating that the will is the final one needs to be added along with the date of the revised will. An executior has to be appointed who will administer the will after the death of the testator. The foundation, when delivering lectures to corporate reiterates the value of a will in extending corporate social responsibilities by citing examples of Alfred Nobel who institutes the Nobel Prize through his will and Sir Ratan Tata who founded institutes such as the Tata Institute of Social Sciences and the Tata Institute of Fundamental Research through his will. “Today, we encourage the addition of organ donation as a part of the will or an annexure to the will,” says Pai. “If everyone pledges something to society there can be a revolution,” Pai concludes. well we r the ashavali weavers in gujarat , i know patola weavers of patan too but didnt knwe if she provided ny technical support to weavers ..